Alterna Caviar Anti-Aging Anti-Frizz is a brand-new luxury line that reduces frizz effect up to 80% for 72 hours. These sulfate-free and paraben-free products - shampoo, conditioner and styling products - protects hair from humidity like an invisible shield while smoothing the cuticles perfectly for longer-lasting results. 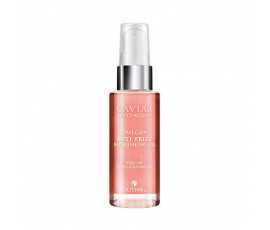 Alterna Caviar Anti-Aging Anti-Frizz removes frizz effect definitively. All Alterna Caviar Anti-Aging Anti-Frizz range is enriched with a fine, concentrated formula: Caviar Extract fights natural, chemical and environmental ageing, leaving hair young-looking instantly; Abyssinian Oil uniquely softens and smooths very unruly hair while the patented Climate Shield Complex technology controls the level of hydration and provides hair with anti-frizz effect, leaving it smooth and soft.